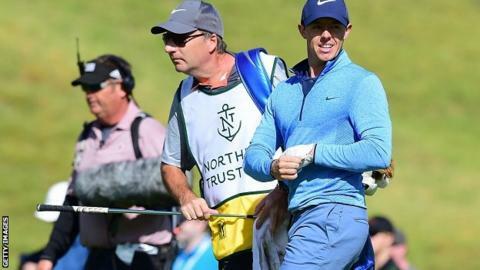 Rory McIlroy will go into the final round of the Northern Trust Open in California two strokes behind leader Bubba Watson. The Northern Irishman, ranked third in the world, shot a third-round 67 to move to 10 under for the tournament. Watson also shot 67 for 12 under to lead by one from fellow Americans Jason Kokrak, Chez Reavie and Dustin Johnson. McIlroy is in a group of five players that includes Australian Adam Scott and South Korea's KJ Choi. The four-time major winner posted birdies at the second, sixth, 10th, 15th and 17th holes, with a bogey at the par-four third his only blemish. "I didn't play particularly well but my scrambling was good, my putting for pars was good, I stayed patient and let the opportunities present themselves," McIlroy said. "It added up to a great 67 and I am right in there going into the final day."